A machining environment such as temperature and type of cutting fluid used. Other less significant factors that affect chip formation are coefficient of friction and the surface finish of cutting tool. The chips produced during the machining can be broadly classified into the following types. Continuous chip obtained when cutting of ductile material like aluminium and low carbon steel. The chips come out without fracture in the form of either long string or bend into a tight roll. If this chip hit finished parts of the work, it spoils the finished surface. To avoid this, a chip breaker is used to break continues chip. High back rake angle favors the continuous chip by providing resistance to chip flow. Similar to the continuous chip except the built-up edge at the nose of the tool. At low speed, the heat dissipation at cutting edge is also low. At high temperature and pressure the chip material stick or weld itself to the cutting edge and tool face near the nose. It is called built up edge (BUE). This built-up edge initially gives strength to cutting edge; however the size of the built-up edge increase as cutting continuous and change the tool geometry. At some point this accumulated built-up is carried away by the chip, a part of tool may lose in this mechanism (It is called adhesion wear). The tendency for built-up edge formation can be decreased by using a tool that has a lower chemical affinity towards the workpiece material. Fluctuation in cutting force induces vibration that causes tool failure. Low stiffness of machine tools that allows vibrations. While machining the deformed metal rapture ahead of the tool when compressive force reaches the fracture limit of the material. 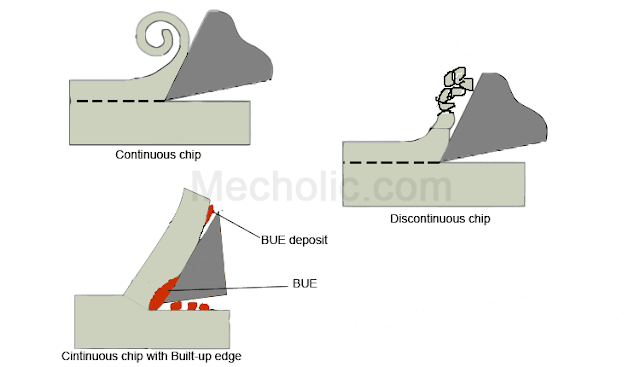 Discontinuous chips are the fragments of the plastically deformed workpiece which are either loosely connected (adhere each other) or entirely separate. The material having low ductility such as brass has this type of plastic chip formation. As most of the heat generated carried out by the chip, temperature at the edge of tool is less, and longer life of tool is the result. For brittle material, discontinuous chip gives a fair surface finish, lower power consumption and increase tool life. But in ductile materials, it causes a poor surface finish and excessive tool wear. Discontinuous chips are convenient to handle and dispose of. They are semi-continuous chips formed due to non-uniform strain on the material during cutting. It has sawtooth-like appearance due to zones of low and high shear strain. This type of chip formed in a material whose mechanical strength decreases with increase in temperature (thermal softening) and which have low thermal conductivity. A non-homogenous chip formed during machining of titanium alloys at medium speed.